More photos from China today – enjoy! Just few of my favorite shots from Hefei. I’ve been organizing all the photos we took from three separate cameras (dad’s camera, sister’s camera, and my own) and it’s taking up quite a bit of time. I guess that’s what Saturday nights are for right? Thank goodness mom didn’t bring a camera too. Hope the week is off to a great start for everyone. Deep-fried and salted young bamboo roots. More crunch than chew, a great beer snack. My favorite dish from our “mock meat” lunch. This is pork belly (fat included) all made out of tofu and wheat gluten. More tea. Remember, your teeth are the strainers! Regional dessert specialty – peanut oil and sesame cookies. Preserved duck eggs with peppers. Served in a vinegar and shoyu bath. The puffy white balls are tofu, but a creamy and light version I haven’t had elsewhere. Braised with broccoli, eggplant and pork balls. A very cozy dish devoured on the one rainy day we had in Hefei. No tidy two-tops or bar seats. Tables for 10, 15, and even 20 on certain occasions. Such was nearly every meal in China. And though I prefer eating in small groups, some of the best moments during this family vacation took place around these large tables. Bai jiu, the local white liquor is poured at both lunch and dinner. Cheers and gan bei! “Gan bei” translates to “dry the cup,” and that is taken seriously. But unlike the American custom of saying “cheers” at the start of the meal, and drinking at your own pace, in China you have to say “cheers” every single time you want to take a sip. And usually you say cheers to the whole table. So everyone has to take a sip. And thus everyone ends up drinking at least 20X more than planned. On the weekend agenda: attempting to re-create a pot of the Red Date Tea pictured above. It was served to us at the beginning of this dinner in Hefei, China, and I’ve been craving it since. Hot, potent and honey sweet. A little goes a long way. Simple: green tea brewed with dried red dates. Bet it would be just as marvelous served iced. 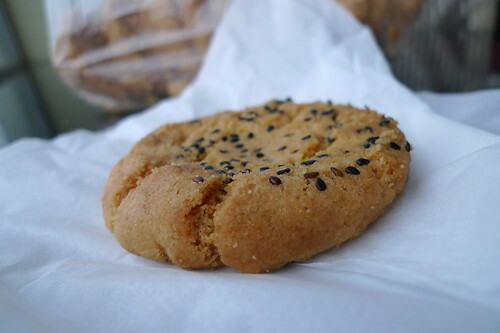 In Hefei, a small city located within the Anhui province of China, the local sweet/dessert specialty are these sesame-speckled cookies. The cookies are fattened from a combination of both peanut and sesame oil, making them incredibly fragrant with a rich, crumbly texture. Mini-versions are available as well. The original size cookies are speckled in black sesame seeds while the mini ones have toasty white sesame seeds. Single biters, just drop ’em in your mouth. Purchased by the pound! I thought this was a bit excessive, but somehow my sister and I finished it all. They’re not crunchy, but crumbly-crisp, just melting in your mouth like ahhh. Seriously made for a hot cup of green tea. …but they are equally moist and fluffy! In China we had watermelon with every meal. Sometimes it came at the start, in the form of a fresh puree. I could drink gallons of this. Just fresh watermelon, blended and nothing else. It was always served at room temperature. Anytime I asked for the puree cold or iced, I was told that it was just not done that way. And that watermelon is best enjoyed at it’s “natural” temperature. Most times we had it at the end of the meal, a whole watermelon cut into slices. No dessert, this was dessert. These watermelons were sweeter than anything I’ve enjoyed in the US. And it wasn’t limited to restaurants, – upon check-in at any hotel we visited, there was fresh watermelon waiting in the hotel rooms.